Matthew Simmons/GettyDavid Spade with his sister-in-law Kate Spade in Los Angeles in 2006. The actor shared his memories of her after she died on Tuesday. The fashion designer Kate Spade died Tuesday in an apparent suicide. Kate Spade’s sister also said she had mental illness and seemed fixated on Robin Williams’ death by hanging in 2014. 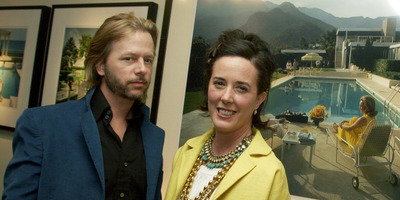 Kate was married to David’s brother Andy Spade, who was also her business partner. “Fuzzy picture but I love it. Kate and I during Christmas family photos. The messages appear to allude to mental illness, with celebrities, fashion-industry figures, and fans also reacting to the designer’s death with messages about mental health. A housekeeper found Kate Spade hanging from a red scarf on a bedroom door in her Park Avenue apartment, the Associated Press reported, citing law-enforcement officials. Spade had mental illness for years, her sister Reta Saffo said. She suggested that the designer may have been thinking about killing herself as early as 2014, when the comedian Robin Williams died. “I will say this was not unexpected by me. I’d flown out to Napa and NYC several times in the past 3-4 years to help her to get the treatment she needed (inpatient hospitalisation). Saffo added that she and Spade were at a hotel together in Santa Fe, Mexico, when they saw reports of Williams’ death in August 2014.